1. Mix the ginger, garlic, spring onions, star anise, chicken stock and mushroom stems in a large pan. 2. Bring to a boil and cover with a lid. 3. Simmer for 20 to 30 minutes. 5. Strain through a muslin cloth or sieve and discard the solids. 6. Heat oil in a another pan over medium flame. 7. Add the sliced mushrooms and saute for a minute. 8. Add the sake and cook for 2 to 3 minutes. 9. Add the strained stock and bring to a boil. 10. Reduce flame and add the chicken pieces. 11. Add salt, honey and soy sauce. 12. Simmer for 2 minutes. 13. Add the noodles to individual serving bowls and pour the soup over it. 14. Garnish with spring onions. 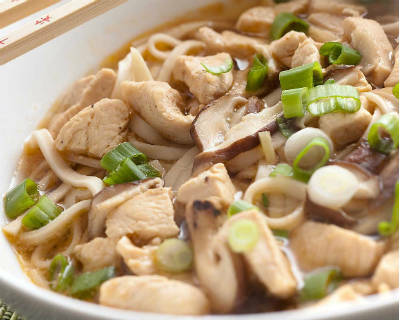 Feel free to comment or share your thoughts on this Chicken Udon Soup Recipe from Awesome Cuisine.